This June has been a weird one. The weather has been unusually cool, and the Yakima is running much lower than typical early summer flows. The good news? The fishing over the past two weeks has been pretty damn good, and continuing to improve every day! The nymphing during the middle of the day has been great with a stonefly nymph or tungsten beadhead trailed by a smaller beadhead dropper imitating either a caddis pupa or PMD nymph. The evening dry-fly bite has picked back up after a brief slow down, with fish up and eating caddis, as well as a few stoneflies. A big foam dry like a Chubby Chernobyl trailed by an elk hair or CDC emerger has been a good blind-casting rig. 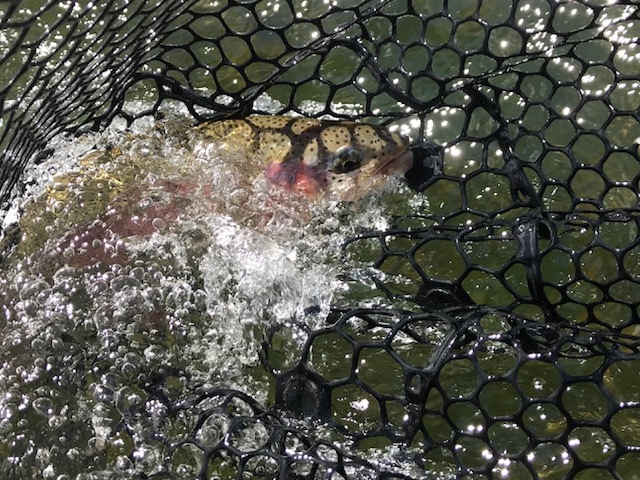 Now that we're halfway into June, we are looking forward to our summer stonefly hatch, which will get rolling around the end of the month, and should provide great dry-fly fishing early and late in the day throughout the summer. In addition, we will see caddis and PMDs through most of the summer, with some great terrestrial fishing thrown in during August and September. Summer fishing is happening and the best is yet to come! Our guides are psyched and ready for some summer dry-fly fishing. Get out here and join us!